The Donegal County Board has denied reports three players were fined for failing to turn up for a mandatory drugs test last year. However it confirmed the county was fined for failing to inform the Irish Sports Council that a training session on 4 April 2013 had been moved to a new location at short notice. Training was switched from Castlefin to MacCumhaill Park in Ballybofey. 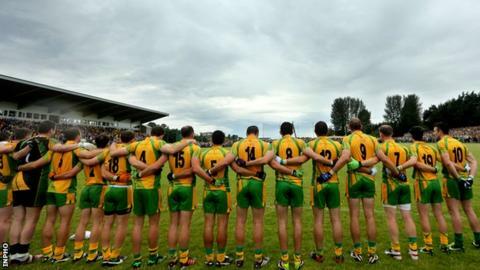 Donegal has revealed it received a €750 fine for the error. Reports locally suggested three county players had fallen foul of the strict drug-testing guidelines, which Donegal dismissed in a statement on Tuesday night. "[Donegal] wish to clarify that no players from the Donegal senior football team received fines for failing to turn up to a mandatory drugs test last year. "[Donegal] co-operate fully with the Irish Sports Council at all times in arranging drugs tests, and the normal practice is two players are randomly selected to participate. "Representatives of the Irish Sports Council attempted to carry out a drugs test on CLG Dhún na nGall Senior Footballers at Robert Emmet Park, Castlefin on 4 April 2013 at 6.40pm. "On that particular evening, training had been moved from Castlefin to MacCumhaill Park, Ballybofey at the last minute, and the ISC had not been notified of the change of venue. "As a result, [Donegal] received a fine of €750."